Donald Lee Earp passed away peacefully surrounded by his four daughters on February 12, 2019, at the age of 84 years old. Mr. Earp was born August 17, 1934 in Biggsville, IL to parents Wayne Ross and Marian Ruby Earp. He was a devoted husband, father, grandfather, and great grandfather and a dedicated member of the Roseville Methodist Church. He married the love of his life, Carole Faye Brantner, November 24, 1957 in Lanark, Illinois. They were happily married for 56 years. Donald was a graduate of Biggsville High School and then enlisted in the United States Army. He was a lifelong farmer until his retirement in 2003. Donald was a pilot and a member of the Monmouth Flying Club, Warren County Fair Board, Roseville Township Board, Roseville School’s Advisory Board, Roseville School Foundation Committee, Warren County ASCS Board, FHA Board, Tri-County Farm Bureau, a spokesman for the Warren-Henderson Tractor Safety Committee, a recipient of the Ag Service Award presented by Warren-Henderson Farm Bureau, and a proud member of the Roseville American Legion. He was preceded in death by his wife, Carole Faye and great granddaughter, Josephine Faye Mangieri. His survivors are his daughters, Susan Leigh Cozza, and husband, Daniel, Washington, MO; Gayle Jean Mangieri, and husband, Joseph, Galesburg, IL; Candace Joyce Ringling, and husband, Todd, Palmetto, FL and Kristine Faye Scholten, and husband Steve, Pella, IA. Also surviving are his grandchildren, Carlie (Howard) Mortensen, Joseph Clayton Mangieri, Madison Faye Scholten, Jackson Ray Scholten, Colton Lee Cozza and great grandson, Wellington Francis Mortensen. He is survived by his brother, Gerald Earp, Sequim, WA and sister, Joyce Haning, Minier, IL. 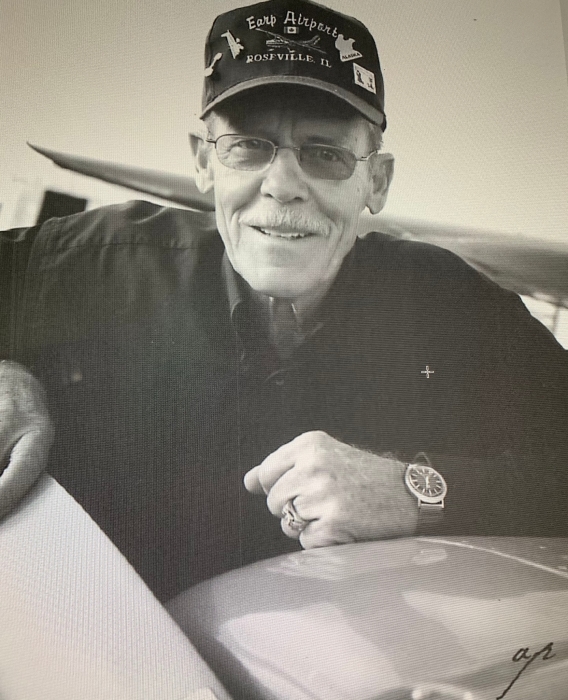 Donald was a hard working farmer, but also enjoyed flying, woodworking, boating, and hunting. He was devoted to his wife and children and caring for his land and his community. He was so very proud of his children and grandchildren. He loved to laugh and was a real prankster. Funeral service will be Friday, February 15, 2019, 3:30 p.m. at the Roseville United Methodist Church Roseville, IL Rev Dennis Powers and Rev. Tom Mehaffy will officiate. Visitation will be Friday, February 15, 2019 from 1:00 – 3:00 p.m. at the Church. Burial will be in the Roseville Memorial Park Cemetery Roseville, IL, where Military Honors will be accorded at the grave by the Roseville American Legion Post 614. Please sign the online guest book at www.wisefamilyfuneralhome.com. Memorials may be directed to the Roseville United Church and Post 614 of American Legion. Wise Family Funeral Home in Roseville, IL is in charge of the arrangements.